Hakusan, Japan, April 09, 2015 – EIZO Corporation (TSE: 6737) today announced the integration of IMAGICA’s 3D LUT data into ColorEdge CG318-4K and CG248-4K color management monitors for displaying and editing images taken in the Rec. 2020 color space. Rec. 2020 can reproduce colors that cannot be shown with Rec. 709 for extremely vivid images. 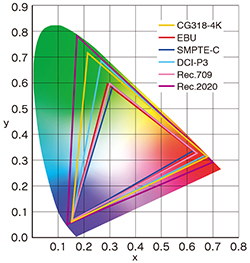 As it becomes more standard in fields such as photography and digital cinema, the number of display and capture devices supporting this color space is increasing. IMAGICA Corporation is a post-production company for motion pictures, television programs, and commercial editing based in Japan. The 3D LUT data developed by IMAGICA is integrated into EIZO’s new ColorEdge 4K monitors, which include a Gamut Warning preset. When selected, the areas of a Rec. 2020 image that cannot be reproduced using Rec. 709 are clearly indicated by converting them to shades of gray. An additional mode called Rec. 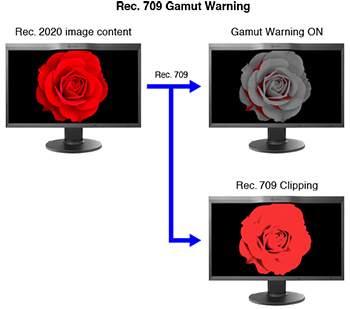 709 Clipping allows the editor to view Rec. 2020 images with the Rec. 709 color space, simulating how the content would look to their audience in an HDTV environment. Each preset mode is easily accessed using the switches on the monitor’s front bezel, allowing users to confirm the color in real time during the editing process. With this technology, working with and editing high-resolution content for broadcasting is made more efficient.